RightAnswers is the #1 provider of cloud-based knowledge management, web and mobile self-service and social knowledge solutions designed to transform customer service and deliver remarkable customer experiences. The company’s flagship product, RightAnswers Enterprise Knowledge Hub, is a unique combination of software, services and knowledge automation that encourages enterprise-wide collaboration and knowledge sharing. RightAnswers software is not only verified for Knowledge-Centered Service (KCS), the leading knowledge management methodology, but also provides KCS workflows and templates out-of-the-box, for the fastest KCS onboarding. Our 450+ clients around the globe, including Fortune 1000 companies, financial services firms and government agencies, use RightAnswers seamlessly integrated with their CRM, ITSM or other customer service software to streamline their processes, increase knowledge adoption and usage, deflect more calls to self-service and save millions of dollars a year. Are you challenged with supporting more applications while trying to bring down costs? Top KCS℠ tips on how to keep your customer support agents engaged with your knowledge. Good news for ServiceNow users: You can now extend the power of ServiceNow across the enterprise! ServiceNow now handles not just support tickets but also cases for all departments, such as Customer Service, Finance, HR and so on. But to be effective, the knowledge each department is creating has to be easy to use and easy to find. As more people create knowledge, it becomes even more important to build it the right way. A Pink Elephant & RightAnswers Webinar: Is KCS Lean? And Why Does It Matter? If Lean is a set of principles to achieve quality, speed and customer alignment, then you can’t afford to ignore how you create and manage your company’s knowledge. If you are finding it difficult to convince your upper management that knowledge management done well will benefit your organization, then this 45-minute webinar is a MUST-ATTEND event for you and your team! KCS v6: What's In Store? How can Knowledge-Centered Service (KCS℠) improve knowledge sharing across the enterprise? That’s what we’ll explore in this webinar with Greg Oxton, Executive Director of the Consortium for Service Innovation. Are your customer service agents answering questions your other customers could answer? Customer communities increase customer satisfaction by empowering your customers to answer questions for one another while reducing calls to support agents. As customer service pressures mount, outdated technologies will struggle to keep up. Fortunately, RightAnswers, available on Salesforce AppExchange and integrated with Salesforce, brings the right answers to the right people in the shortest amount of time. LESSONS IN CUSTOMER SERVICE FROM THE MASTERCHEF KITCHEN! You will also see a demo of the RightAnswers automated Knowledge Quality tool that improves the quality of your knowledge as it’s being created, eliminating manual operations – because you have enough on your plate already! 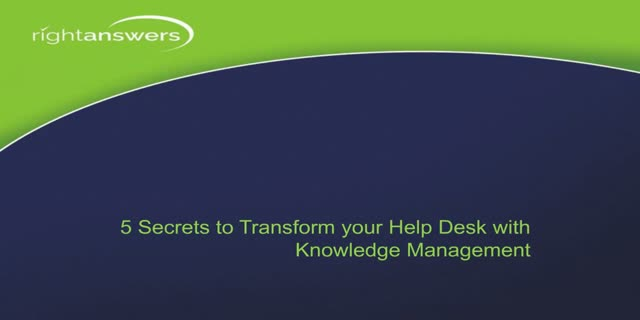 So You Think You're Doing Knowledge-Centered Support (KCS℠)? You've heard great things about Knowledge-Centered Support (KCS) and you've started implementing it in your organization. But are you really following KCS practices?